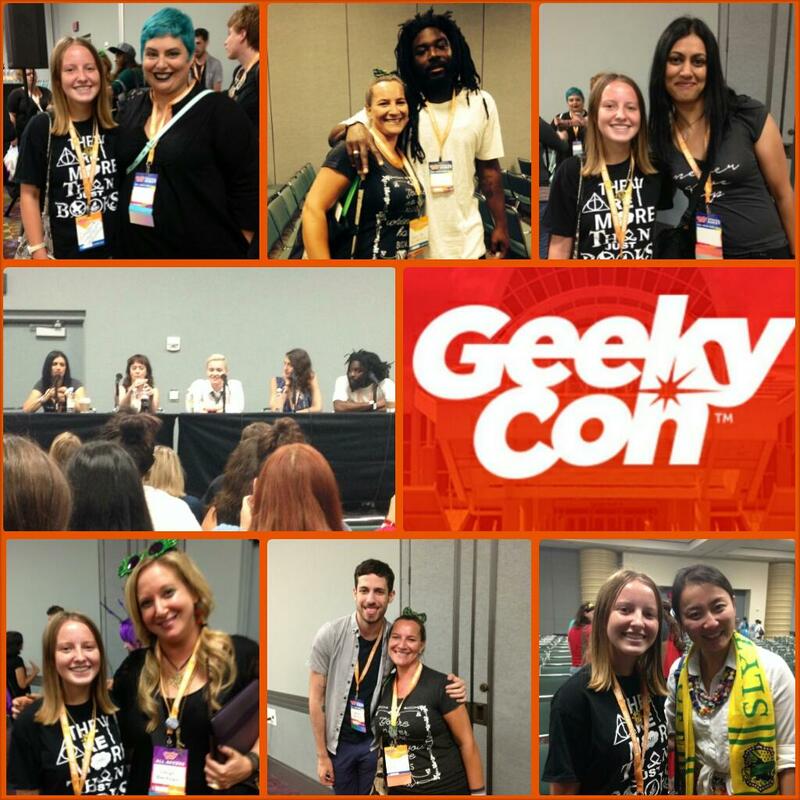 This past weekend my teenage daughter and I made our second pilgrimage to GeekyCon in Orlando for their YA Lit Track. Some of the authors we listened to were Veronica Roth, Maureen Johnson, Leigh Bardugo, Jenny Han, Marie Lu, Tahereh Mafi, Stephanie Perkins, Jason Reynolds, Ransom Riggs, Adam Silvera, Holly Black, Courtney Summers, Robin Wasserman, and Sabaa Tahir!! Today I’ll share some notes I took during the panels. I tried to give some order to my convulted thoughts, but I’m going through Con withdrawals, so bear with me. Page Is A Mirror: Authors talked about stories that inspired them, and in some cases changed the way they saw themselves and the act of writing. They addressed the power of representation, how we see or fail to see ourselves reflected on the page, and what we want from YA moving forward. A lot of books portray diverse characters, but that’s the whole storyline & not just a person who is going through something who happens to be Asian, Puerto Rican …. Jason Reynolds said he was looking for a character in books that did fit all his cultural codes but couldn’t find it. He found it in music and movies instead. Authors also discussed if they feel the pressure to write about their own “group” . . . Impossible to portray everyone in the culture, & we have to swallow readers expectations or it becomes a different book, but we also have to remain sensitive. We want to write what we want to write but feel a responsibility to reach out. For instance, there’s enough images of poor, scary black teenagers, so it’s important to change that. Another stereotype is Pakistan being considered as part of the Middle East and people there speaking Arabic when it’s really part of South Asia and the official language is English. We can learn a lot from another culture who isn’t our own & it’s important to have these discussions so we do learn. There is a call for white authors to make their books more diverse but important to understand the culture so it’s absorbed into the story & it feels organic. It’s hard because there’s this Internet Witch Hunt whenever an author gets something wrong & people calling them out with a vengeance (used Mosquito Land by David Arnold as an example)… But you can’t write colorblind because our country isn’t colorblind so if we do, it feels cheap. Notes on Love Scenes: It’s hard sometimes when writing romantic scenes to distinguish between what’s real & what’s wish fulfillment … and then sometimes we include things in books that did happen in real life, but it ends up sounding psycho on the page. Other times, it sounds so cheesy you think it’ll never stick but readers eat it up. Think of ‘And so the lion fell in love with the lamb’ line in Twilight or Okay? Okay. in TFIOS & how it became so romantic. The simmer became a beautiful boil. Keep in mind when writing YA, it’s going to be awkward for a teens first time. Certain body part words are jarring in YA so be mindful of that. Make sure you include the other person in the scene too & what’s going on with them- not just the POV main character. Scenes need strong emotional core readers can relate to & characters who can learn from their mistakes, except learning a lot faster so our readers can learn from them in return. Ambiguity isn’t really rewarded in YA. As kids we want the happily ever after, but many of the panel authors also feel obligated to not have full closure in their books because that’s not life, and it’s also comforting to know others aren’t certain either. Always keep in mind, what’s the end result you want from a scene? Notes on Fight Scenes: It doesn’t matter if we blowup the building if we don’t care about the people inside. Think of Wes Craven Scream & how every single character in a scene has good lines & you want all of them to live. Think of It by Stephen King & caring so much about the kids. For fights, you’ll most likely be writing scenes you’ve never experienced, so do a lot of research. Yes, there’s Google, but also talk to people- they’re usually very eager to talk about their jobs, lives, etc… Be willing to accept help. Funny side note, when Veronica Roth (author of Divergent series) was asked about her weapon of choice, she answered wasp spray. Check out an article here about using it for self-defense. Turns out, it was a pretty good answer! Plot Hospital: Holly Black and Leigh Bardugo helped diagnose problems in people’s manuscripts. *Think about what the character wants vs. what they need. *Think from a readers POV & what they want to happen from the end & would be disappointed if it wasn’t there. *The hardest thing about writing is being at the crossroads & making a decision about where to go. *Retelling an old story like a fairy tale & stealing the structure is a great idea if you’re struggling with plot. *Have to know who your main antagonist is and think, what makes a villain a villain? Read MG story The School of Good & Evil for a good example or watch Orphan Black- that show doesn’t save plot; twists that you think will take multiple shows to resolve takes 20 minutes. They are very brave in their storytelling. This has been a post for the Insecure Writer’s Support Group, the brainchild of Head Ninja, Alex J. Cavanaugh. Feel free to join us the first Wednesday of every month! Wonderful notes. Thank you for sharing. I’m going to reread this again. I love all the info one gets at conferences. Sounds like an awesome conference. I’m so jealous that you got to meet so many fantastic authors. That’s so cool! Glad you and your daughter had a good time! She looks a lot like you, Jamie. Wasp spray. I’m going to remember that. thanks for sharing, Jamie. Some good stuff here! My pleasure . . . thanks for reading! It sounds like you had a blast at that conference. I love the point about not making a character’s diversity the entire story. That’s so insulting, annoying, and pandering, since real people aren’t completely defined by the fact that they happen to be a certain race, religion, ethnic group, socioeconomic group, disability, etc. Sooo True. Unfortunately, a lot of other people in real life treat them like their race, religion, etc . . .is their whole person. I’m going to be taking some of those tips to heart as I dive into my next WIP. Sounds like you two had a lot of fun. Looks like you both had a blast and here’s to you being on that panel next year! Great stuff. Thanks for sharing! The insights on YA and romance are extremely helpful.